This patient sustained trauma to the earlobe after an earring had been “pulled” from her ear (A). She lived with this deformity for several years after being told by her primary care physician and the physician in the ER that “nothing could be done.” Her earlobe was repaired under local anesthesia in Dr. Harmych’s office. The sutures were removed after one week (B) and the ear was pierced at 6 weeks (C). Procedures performed to correct earlobe deformities caused by gauging, stretching and earlobe trauma are incredibly common. Although many patients believe, and in some cases are told by a physician, that nothing can be done to fix these deformities, earlobe repair procedures are some of the most common procedures performed by cosmetic surgeons. 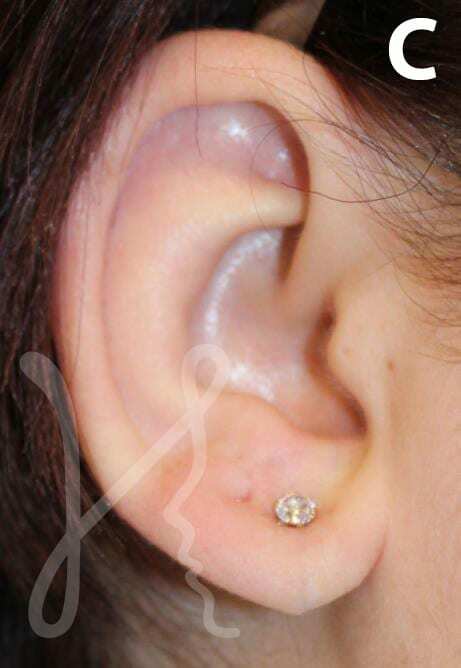 The three most common deformities of the earlobe are a split earlobe, stretched earlobe, and “gauged” earlobe. 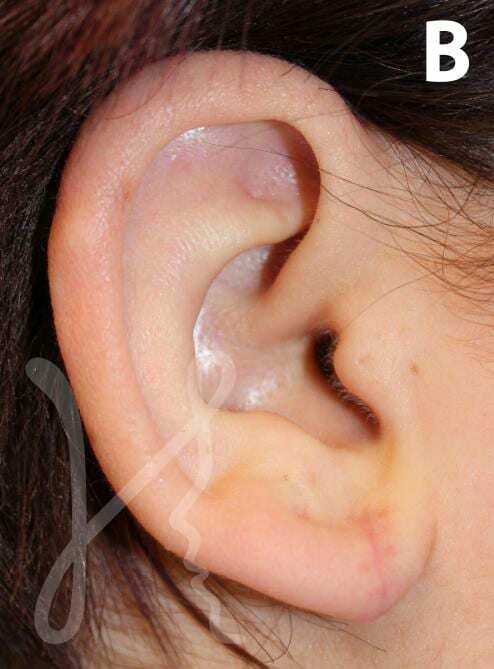 One of the most common earlobe deformities is a completely split earlobe. This deformity is usually caused by some sort of trauma. Having an earring torn out of the earlobe is an example of one such type of trauma. In this case, a vertically-oriented tear results, thus “splitting” the bottom portion of the earlobe into two parts. 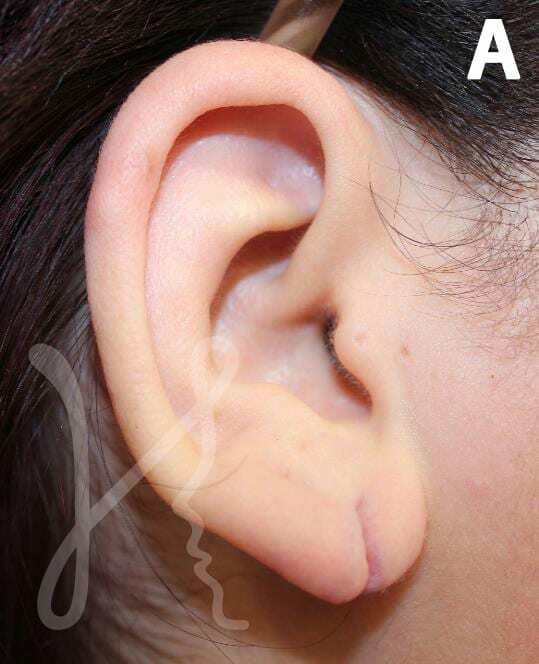 A stretched, or elongated, earlobe is another common type of earlobe deformity. This often results due to the effect of gravity and is caused by wearing heavy earrings for a prolonged period of time. Additionally, the overall aging process, which causes almost all tissues of the body to sag, affects the earlobe as well and compounds the effect of prolonged heavy earring use. While this process may not cause a noticeable visual deformity, it may interfere with a patient’s ability to use the piercing and hence, wear earrings altogether. Because of the larger size of the stretched piercing patients often fear that they will lose their earrings. In fact, I recently had a patient tell me that she has been unable to wear her diamond earrings for the last ten years, a gift she received for her 25th wedding anniversary. Another common earlobe deformity results from having the earlobe purposefully stretched to accommodate larger ear rings through a process called “gauging.” Although the earlobe is incredibly resilient, and usually tolerates the gauging process well, if it is performed too rapidly the gauging process can restrict blood flow to the earlobe causing the skin to become damaged. The risk of earlobe damage is especially high in patients who smoke, or those with diabetes and other diseases that affect the blood vessels. Stretched earlobes may also interfere with a patient’s social or professional life, making it more difficult to find a job. For example, the U.S. Army policy allows a maximum diameter of 1.6 mm for an earlobe piercing. Most patients are quite comfortable undergoing earlobe surgery using only local anesthesia. This allows patients to have their earlobe repair performed in the plastic surgeon’s office. The procedure is almost painless and takes about 30-90 minutes. How much does earlobe repair in Cleveland, Ohio cost? Cost of earlobe repair in Cleveland, Ohiois determined by the complexity of the procedure. Depending on the complexity and severity of damage, the cost of earlobe repair can range from a few hundred to a few thousand dollars. Is there down time after earlobe repair? Patients may return to work and light exercise immediately with little to no downtime. Patients considering earlobe repair should carefully review the credentials and training of their surgeon. There are three certifying boards for physicians practicing comprehensive facial plastic surgery: The American Board of Facial Plastic and Reconstructive Surgery, The American Board of Plastic Surgery and The American Board of Otolaryngology. For patients considering any type of facial plastic surgery, the best and safest choice is a surgeon certified by one of these boards.